A jacket that is lightweight and breathable. To keep you warm and comfortable all day with plenty of storage options. 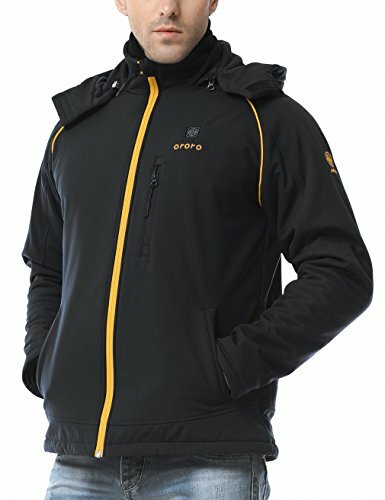 The thermal jacket, concealed working with battery for keeps you warm all day on site prior to operation time of 6-8 hours. With its 3 heating levels with a sensor touch button on the back. With ORORO Power Bank, not only can you power the jacket with this energy supply, but you can also power most USB port compatible devices such as cell phones. Incredibly lightweight, warm& comfortable, you can finally say goodbye to that bulky jacket that gets in the way of you doing your job with speed and efficiency! KEEPS YOU WARM AND COMFORTABLE: Soft shell fabric on the outside make the jacket water and wind resistance but still soft and flexible. The interior has some light insulation with a fleece lining to keep the heat in and the comfort level high. If you have any questions about this product by ororo, contact us by completing and submitting the form below. If you are looking for a specif part number, please include it with your message.